I took this shot today in the city center. 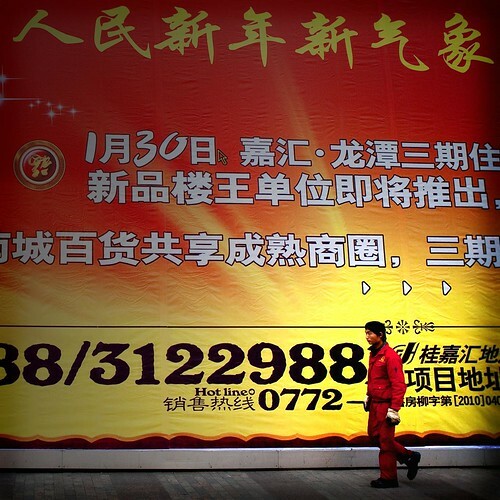 Real estate advertising dominates every form of media in Liuzhou. I suspect it’s the same across China. Apartments everywhere, some built no more than 20 years ago, are being torn down here for “new and improved” modern mega-complexes. The self-contained developments include apartments, office space, retail space and grocery stores. I’m going to pull in the reigns a bit over the next few days. I need to get to work on some projects before the next term begins. I’m especially getting short on the time needed to re-design the websites. I imagine I’ll be around but maybe not so active for a few days. We’ll see… Peace! Nice image and essay. I have experienced the housing boom in Tianjin as new projects have sprung up. It’s really amazing isn’t it? I’m doing a long-term documentary following one person’s quest to buy a home and it has been an eye opener. After years of saving and missteps and setbacks she finally purchased her house just today. That’s not the end of the story of course, they still have to wait for the house to be built and then finish out the decorating, a process that may take two more years. That’s like between a mauve and pink isn’t it? With the recent heat we’ve been having, I’m going to go with any of the warm hues.